Carl Sagan, in his novel 'Contact', made the suggestion that amidst the statics that are present in the universe, one could infer that there is intelligence involved. Watch the movie and you know what he meant by that. The implication is that as long the thing is not randomness, that suggests signs of intelligence. 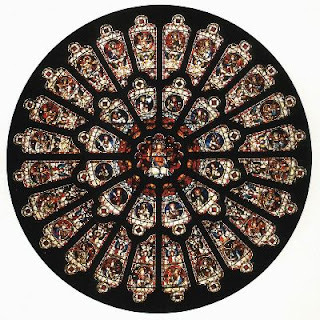 Now the picture below is a picture of the rose window in York Minister. You know it is not there by random. Now the thing you see below is a cross section of a DNA. If macro-evolution theory is true, this ought to look random too. I always wondered what's the big deal about a cross section of the DNA looking like the Rose Window... until I saw this. This is information, no randomness. Such is the beauty of God's creation. It's been quiet for a while. Mainly because I am still thinking about the few planned postings which I will be writing. The first that will need to be due is a new post on faith and reason, opening up the can again to pen down my latest thoughts and findings from my studies. The second post will be the final post on Apologetic Methodology, which ties in closely with the post on faith and reason. There are other posts which I will be writing. Just to give you all a heads up. "Long separated by cruel fate, the star-crossed lovers raced across the grassy field toward each other like two freight trains, one having left Cleveland at 6:36 p.m. traveling at 55 mph, the other from Topeka at 4:19 p.m. at 35 mph." —"Strange World," Campus Life, Vol. 56, no. 9. D.L Moody told an interesting testimony in his book: Men of the Bible and I think it's worth retelling here. A few years back, I remember bringing my cg and treating them to watch the movie, 'The Bucket List' and subsequently posted some of my thoughts here. I have since not treated my subsequent cgs (or LG now) to any movies. Think it will remain that way but my current LG has gotten better treats. This movie was screened in last year's ID2010 conference and we were asked to watch the movie from the perspective of a disciple and a disciplemaker. Read a report in Insing.com on demanding boss in Singapore. Apparently, Singapore has the most demanding bosses in the world, with 96% of them expecting their staff to be reached during out-of-office and vacation leaves. We are only topped by Hongkong: 97%. I felt a pinch of truth in the report. Thinking about it, how often do we find ourselves knocking off on time, and even if that is possible, how many of us find ourselves doing work at home? I see this in my bosses, though I am quite fortunate not to be activated unless absolutely necessary. But the thought that people can't knock off on time and can't take a mental break from work outside of office just irked me a lot. How much competitive and productive can we get if we find ourselves working beyond what's necessary? Such is the peril of emails and mobile devices nowadays. Are you the person whom the person you are looking for is looking for? Just thought that my previous post missed out some caveats that I should fill in. I have met several people who questioned me last time when can we tell that we are ready for relationship? Does it mean that we need to be financially stable before we are ready? Does it mean that we need to have a stable career first? I have not really been able to answer these questions but now I shall give it a try. Sometime back, I posted my understanding of a godly BGR here. In it, I expounded on Issac and Rebekah and argued for certain principles from the bible that are useful for us to follow, in order to honor God in a relationship between man and woman. Of course, part of the principles looked at the criteria that one should watch out for in a life partner. What I have never made clear enough is the fact that while we look out for these criteria, we need to bear in mind that we will be judged by the same criteria as well. I was meditating on the issue of Holy Spirit Baptism yesterday, thinking about the debate of the signs of Holy Spirit Baptism. By definition, Holy Spirit Baptism is a given in Christianity. Any Christians worth his salt and who have studied the bible will know that as Christians, we are promised the baptism of the Holy Spirit. You can check out the verses in Bible Gateway by searching for the exact keywords. What is really in dispute is the question whether tongues is a compulsory sign of Holy Spirit baptism.